Image caption The hospital trust accepted the concerns should have been addressed with "more vigour and urgency"
A surgeon was allowed to continue practising despite concerns over his ability, a report has found. Royal Cornwall Hospital (RCH) surgeon Rob Jones had been the subject of eight reviews and repeated complaints during his 12 year clinical practice. A review of obstetrics and gynaecology patients treated by Mr Jones found 52 suffered complications, and a further 57 were recalled for assessment. 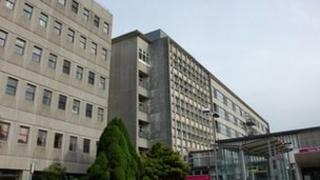 The Royal Cornwall Hospitals Trust which runs the unit has apologised. Chairman Martin Watts said "concerns identified about some of Mr Jones' practice should have been addressed with more vigour and urgency". Patients treated by Mr Jones are calling for a public inquiry and some are considering legal action. It's uncomfortable for any hospital to admit to failures in care and difficulties for staff in raising concerns about colleagues. In the light of the Francis report into Stafford Hospital, the Department of Health has said it is absolutely critical that NHS staff are happy to speak out and that NHS organisations are prepared to take their concerns seriously. An independent report highlighted difficult relations between managers and doctors at the Royal Cornwall Hospital. It's been made absolutely clear in this case that it's vital that communications are improved between both sides, something that the trust has acknowledged. Julie Lewis of lawyers Irwin Mitchell, which is representing patients, said: "Patients want answers about why it took RCH so long to restrict Mr Jones' work despite eight reviews being carried out by the trust after concerns were expressed about his work." Mr Jones was suspended last May after a report from the Royal College of Obstetricians and Gynaecologists found a number of serious concerns. They included his patients having more than five times the number of surgical complications during key hole hysterectomy operations than would "usually be expected" in a consultant's career. The college also noted Mr Jones did not "adequately adhere to guidelines" and made "unusual clinical decisions". It was not until last November the trust confirmed it had contacted 2,300 gynaecology patients to have their cases reviewed. It emerged reviews of Mr Jones's work since 2000 had cited failings including "poor communication" and "inadequate handover between successive managers". The surgeon's "powers of persuasion" were also cited as a reason why no action was taken against him. The Medical Defence Union (MDU) which is representing Mr Jones said: "He is of course sorry for any patient who suffered a complication of surgery and to any patient who has had the stress of their care being reviewed." One patient, Claire Hill, who is contemplating legal action, had an operation done by Mr Jones in 2010. The operation went wrong and she had to return to him for a hysterectomy which left her with a "devastating 'fistula' injury", when a hole was torn in her urinary tract. Lezli Boswell, chief executive of the Royal Cornwall Hospitals Trust, said: "The governance systems here weren't as responsive as they are today and perhaps culturally, when people did speak out they didn't get the satisfactory response that we would expect today." Medical director Paul Upton said he was only able to take "definitive action" when specific cases were put in front of him. "People saying that they were a bit concerned but without any evidence isn't enough for a medical director to actually act," he said. The trust said it would implement all the recommendations in the various reports in order to rebuild trust. Mr Jones, who had delivered Prime Minister David Cameron's youngest child by caesarean section in 2010, joined the Royal Cornwall Hospital in 1992. The General Medical Council confirmed Mr Jones voluntarily removed himself from the medical register, last October. The trust said that the results of the assessment of the 57 women recalled would be known when the final Independent Case Note Review is published next month.